Hi, and welcome to the Museum of Things I’m Absolutely Going to Get To Eventually. If some of the exhibits make you uncomfortable, do not worry, I am absolutely going to get to all of this stuff eventually! I really am. Really! If you haven’t been here before, let me give you a quick rundown before we do the tour. The museum was founded several years ago and is a bit of a passion project for me– it’s something that just sort of organically grew out of having three people living in an apartment combined with my inability, between child-rearing, a pregnancy, and writing projects, to find time to do any sort of cleaning or maintenance. If you want we can start in the front room and then work our way back. 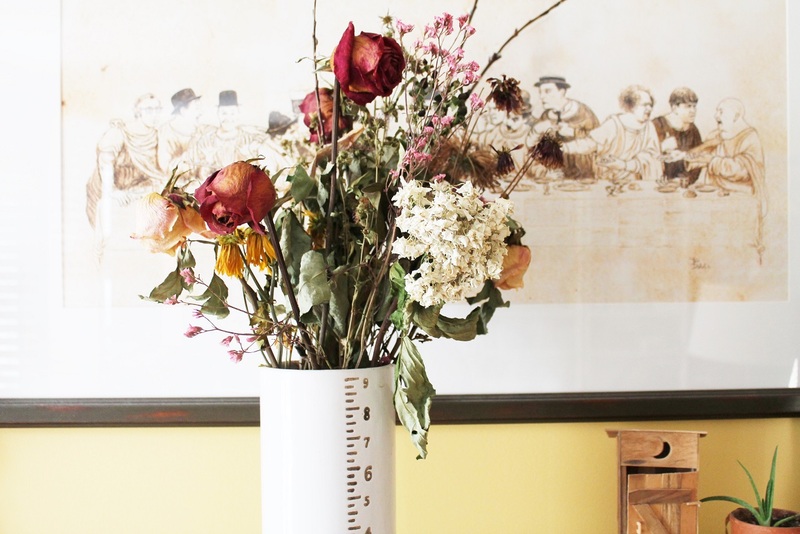 I love to ease people in with this piece, which we call “dead flowers” and which, true to form, is an actual vase of dead flowers. Some friends bought me a bouquet of flowers four months ago and after changing the water two or three times, I literally just left them in a vase until they died. This piece will remain on display until someone else buys me flowers because I’ll need the vase. 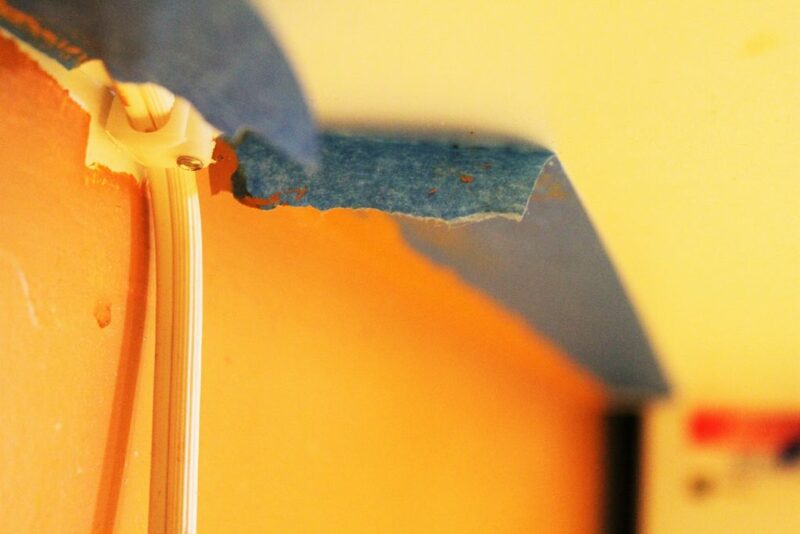 A testament to both good intentions and mild attention deficit disorder, “From When I Painted” was created in 2010 when I taped under the cabinets in order to paint part of the kitchen and then forgot to remove that tape because it’s not easily visible if you’re standing up straight. The piece is revisited each time I bend down to use the toaster, when I inevitably go, “Oh hey, I never pulled off that blue tape from when I painted the kitchen,” and then continue to not remove it as I walk away eating my toast. An ongoing master work, “Lint” is created and re-created each time I do a load of laundry which is probably not as often as I should be doing laundry, considering I literally live with someone who I yesterday caught putting pieces of shrimp cocktail in the cargo pocket of his shorts. 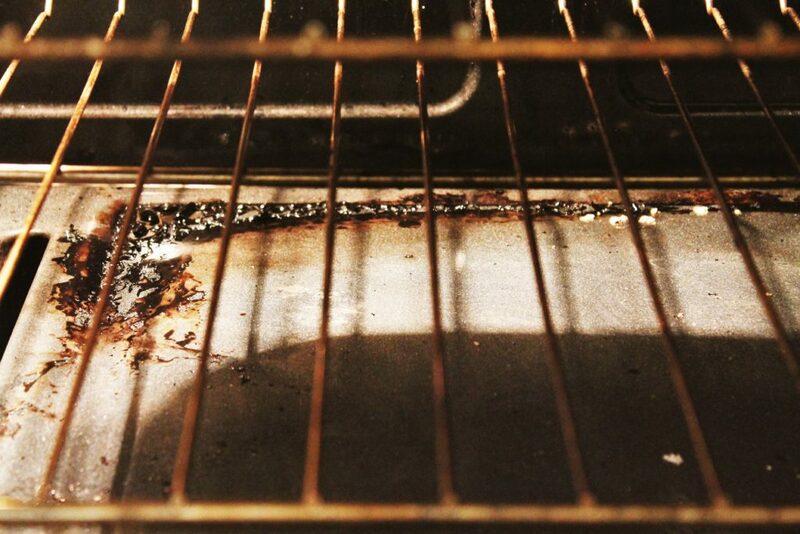 This piece came into being because our dryer is in our living room and the nearest garbage can is over 30 feet away and I would rather let the lint build up for weeks in this bowl than walk literally 30 feet because apparently I am the laziest, most unmotivated person who has ever walked the earth. 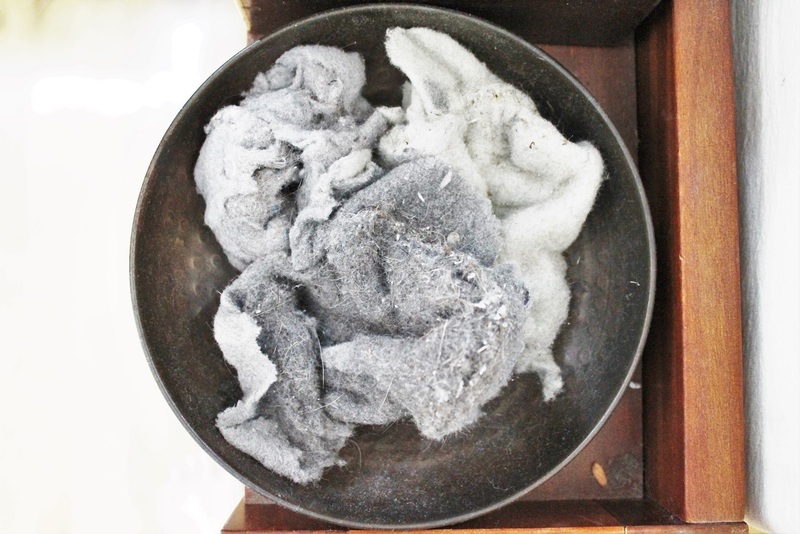 I am also mildly fascinated by the fact that every time I do a load of laundry, enough pieces of fabric are lost to create a tiny gray blanket. I am interested to know how many times I would have to wash a load of laundry for the clothes to disintegrate/disappear completely, mainly because I would no longer have to wash that load of laundry anymore. This piece is mixed media but according to experts is about 80% Parmesan cheese. This is an extremely controversial piece which may cause people discomfort, particularly if those people are my mother who is currently at home sobbing and going, “How hard would it be to just buy a dustbuster??? (Holds face in hands)” While my floors have never been as clean as hers, this has gotten particularly out of hand the further the pregnancy has progressed since I have difficulty getting down low to clean things. 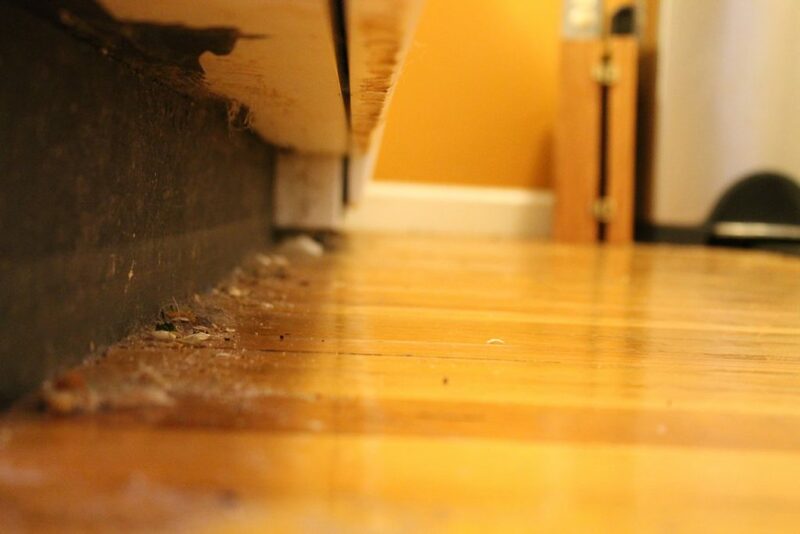 I now look at my kitchen floor in much the way most people look at the political system– thinking, “Oh my, what an ungodly mess,” with mixed feelings of frustration and helplessness. 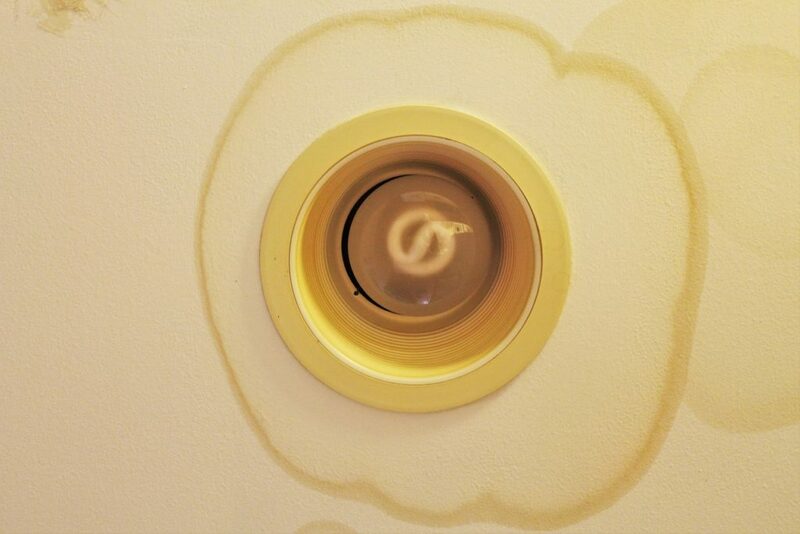 This piece dates back to 2012, during the horrible rainstorms that happened before we got the roof fixed. There’s no mold, just discoloration but don’t stress because I am totally totally going to get around to painting this. Maybe even later tonight I’ll do it. Ok, I’m actually sort of tired tonight so maybe not tonight, but definitely soon. This piece is an L.L. 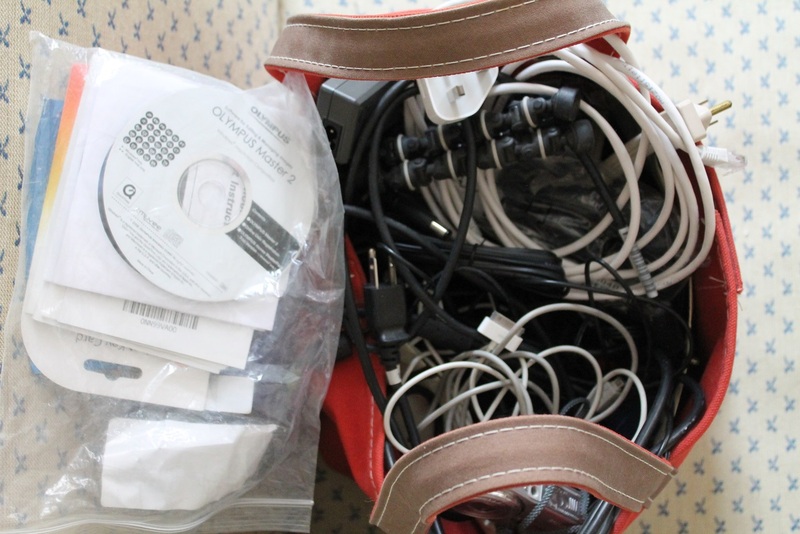 Bean bag full of electronic equipment and cords that I can’t throw away because what if I need one of them someday?? Experts postulate that the bag may contain as many as three flip phones. 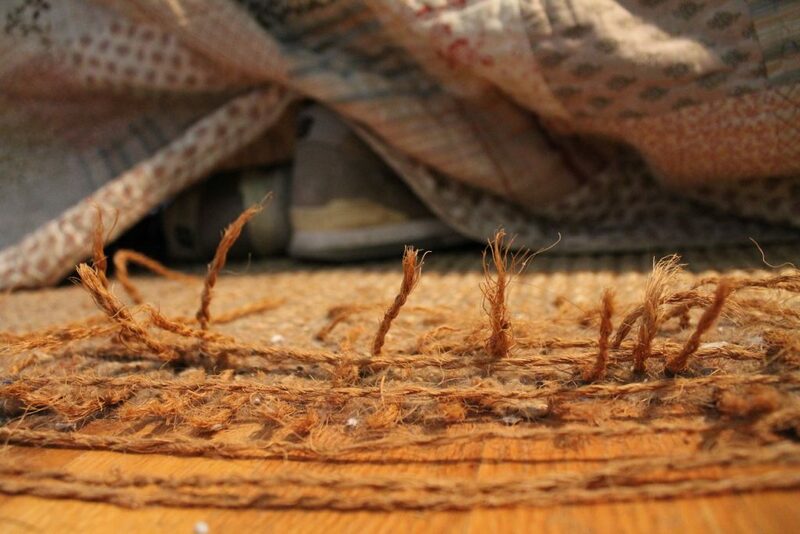 This piece centers around an actual jute rug I obtained in 2008 and involves my waking up every morning and pulling pieces of frayed rope out of my foot. An interactive part of the piece involves me going online once every two weeks or so to look at replacement rugs but never following through and buying anything because what if I get the wrong size or something? 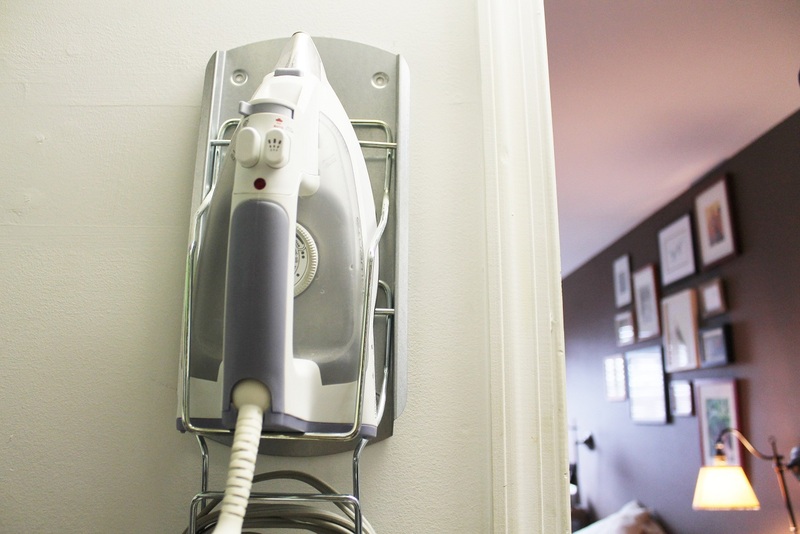 My son saw his grandmother using one of these and went “What’s that?” and I went “It’s an iron,” which was a pretty solid clue to my mother that in the 3 years that he has been alive I have never once ironed anything except possibly my bangs. 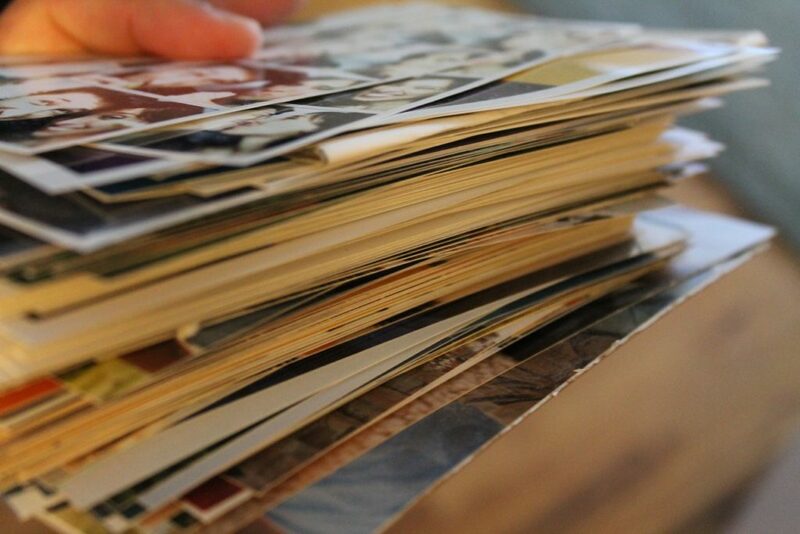 This piece is an enormous pile of photographs that I printed out using Snapfish and am totally going to organize and put in an album as soon as I get a free minute. “Photographs” will be on display indefinitely and is actually an interactive piece that involves someone with older children/more life experience politely laughing at me. If you enjoyed this piece, please follow The Ugly Volvo on Facebook or Twitter. If you are totally horrified and aghast at the condition of my apartment and can’t even look at these pictures without cringing, you should follow my mom on Facebook or Twitter so if she ever starts a public page I’ll keep you in the loop. 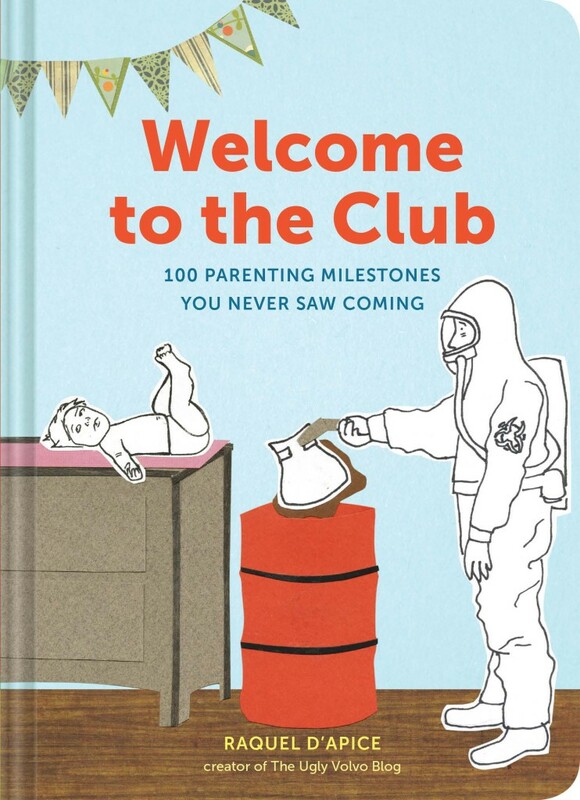 I also wrote and illustrated a book called Welcome to the Club: 100 Parenting Milestones You Never Saw Coming which will be released September 20th and if you’d like to pre-order it, you can do it on Barnes and Noble, Amazon, or Indiebound. 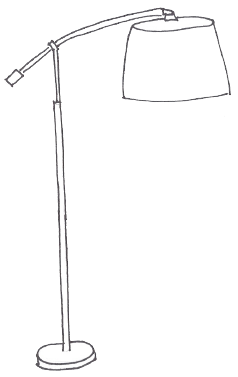 The book is lightweight, deals with parenting, and contains almost no advice. I heard that if you buy a copy you will have nothing but fantastic hair days for the rest of your life but again, you can’t trust everything you read on the internet so don’t quote me on that. If you’d like to visit the Museum of Things I am Absolutely Going to Get To Eventually, we are open every day (including holidays) from 6:30AM – 8:30 PM or whatever time we collapse into bed. Admission is $7 for adults, Free for children under 5.